This looks to be an interesting project (not that I need another one) but I tried to find details on The Engineers Emporium and there's nothing about it on there. Is another company doing the castings and drawings? Useful to know - I had a look on their website and gave up in the end as it's a complete mess. How much spare was there on that casting? Mine seems to have about 5mm top to bottom but the other measurements look tight. Have you thought about your crank Steve? Are you going to do a made up one like the drawings show or make from solid? That's quite alright Simon. I see a forum as a bunch of mates sitting in a pub talking about whatever the subject may be, asking for advice and wandering off down all sorts of alleyways. It's all part of the fun! I am certainly going to be asking for advice! In the meantime, Jo, the castings are not very generous but are OK. One has to be careful as I have already found and will tell you about in a day or two. The crankshaft is pressed together with all of the bearings and rods fitted but I have not yet thought it through how to do it. That is another discussion to have shortly. Meanwhile, the next part will be the sump. 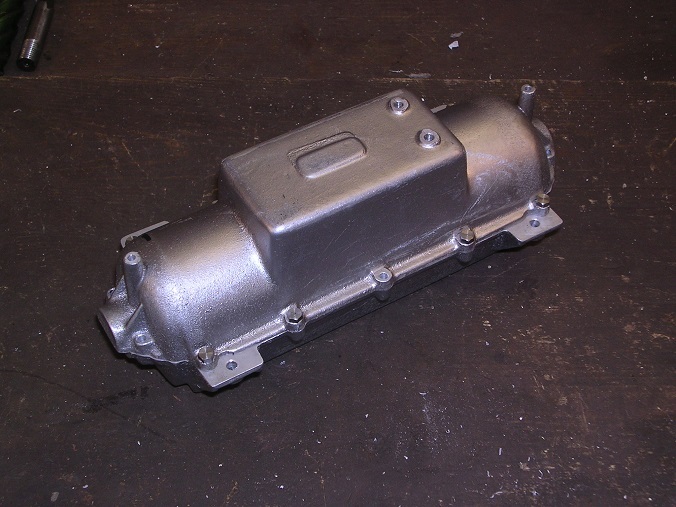 The sump is also an awkward casting to hold. I gave in in the end and simply gripped it gently in the vice whilst I skimmed the joint face. Then turned it over and skimmed the other faces. The two castings match and line up very well so it was simply a case of centre popping the bolt holes by eye and spotting through before tapping. I will make some proper studs eventually but, for the moment, they are held together with bolts. Now, this brings me to the first major challenge. How do I put the crank and camshaft holes through and keep all three holes in line? The crank shouldn't be too bad, in fact, as the reaming size is 1/2" dia. This should be big enough not to wander too much in the centre bearing if I am gentle. However, the camshaft holes are to be reamed 8mm and the last hole is 150mm from the first. How should I go about keeping them in line? My current plan is to use the vertical slide on the Myford to hold the case and use the dials to control the centre distances. I can start the holes in the right place OK but where they go after that eludes me. I would value some advice please! Drill them out to 12mm an 7.5mm respectively and then make up a couple of between ctr boring bars. A 10mm or even 11/16" dia one should not be a problem to make but for the cam use some 7/32" rod, you won't have room for a grub screw from the side to retain the bit so drill in from one end say 25mm long 2.5mm and then tap the first 10mm or so M3. You can now slip in a bit of 7/32" stock and then use a M3 grub screw to push that against a small HSS toolbit. In use the bar can be used to do one end almost to size, then swap it end for end to open up the other end and then finally take that to size. Then without altering the tool bit swap it back round to do the first hole which will ensure they are both the same size. Probably do similar with the crank as it saves having to have a bar that is at least twice the length of the block. 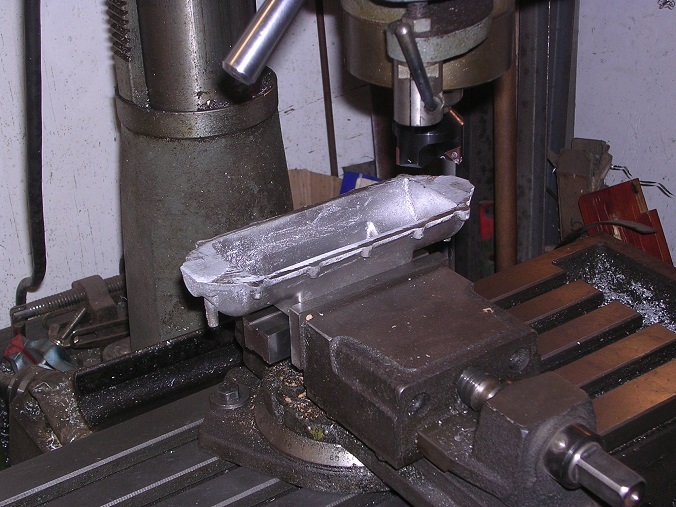 As the case is a difficult shape to hold I would start by mounting it on a jig which would give a nice large flat reference/clamping surface that is square to the casting Then the centres of both the crankshaft and camshaft can be marked & Centre popped. Using an angle plate mount the cylinder, centre on the crankshaft hole then drill/bore. Turn end over end and do the other crankshaft bore (this keeps the offset distance to the bottom of the crankshaft equal). Using a long drill, drill a hole in the centre bearing around 10.5mm leaving space to line bore shortly. Do the same for the camshaft holes drilling the centre bearing 6.5mm. The between centre boring bars can now be made as short as possible with the bushes reducing the unsupported length of the boring bars to about 140mm. You can use your vertical slide, if you wish, to hold the case still on its jig for boring. 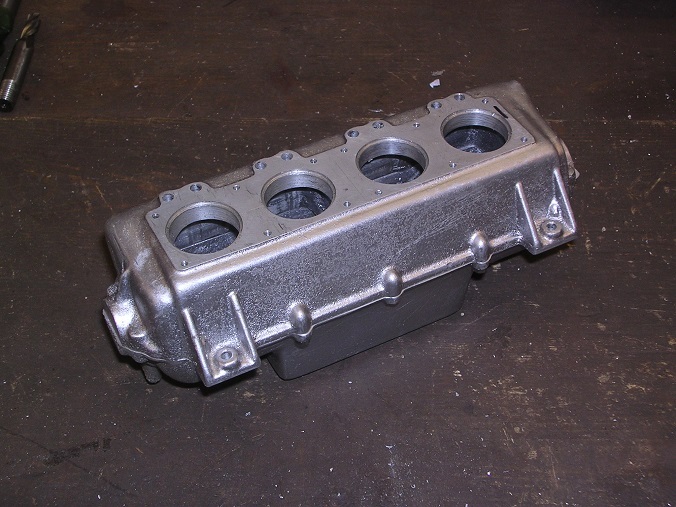 Jo have you modeled the inside of the crankcase to see if there is room to swing split big ends? looks to me to be rather tight on the cam shaft and the oil pan will probably need modification too. Heinz in his instructions says it is possible if you reduce the big end diameter to 10mm which is more than adequate for the bore/stroke. Bad Behavior has blocked 15709 access attempts in the last 7 days. Page created in 0.24 seconds with 19 queries.